Take a few minutes to sit back and celebrate the memories of yesteryear. No doubt many fond memories come to mind including your first date, learning to drive, favorite movies, and songs you loved to dance to and the foods you and your friends liked to order at the hamburger drive-in. All of these special memories of the days when we were growing up bring smiles to our faces. One of the most delicious memories of yesteryear is thinking about the awesome candy from which we had to choose. Wow, just thinking about candy items such as Boston Baked Beans, Wax Lips, Bit-O-Honey and Now and Later Candy makes your taste buds crave to taste them again. These are the candies we have termed retro candy because they were popular back in days of the 50's, 60's and 70"s. As kids we were saving our nickel’s to buy our favorite candy when we went to the grocery store, drugstore, the 5&10 cent store or to the movie. Retro candy can still be found in some stores. The great thing is that if there is a special kind you are looking for you can most likely order it online for a reasonable price. You don't have to wish any longer. Boston Baked Beans are sugar coated peanuts that first began in the 1930's. This crunchy, sugary candy has delighted many children and adult down through the years. Making this candy was not as easy as it may seem to appear. The process from beginning to end took about 4 days. This cold panned process of making Boston Baked Beans was a bit time consuming but the results delicious! How could you ever forget those Wax Lips that were filled with the juicy cherry syrup!!! After the liquid was gone it was fun to chew on the wax for as long as possible. Along the same concept of the Wax Lips were the Wax Teeth and Wax Soda Bottles. Depending on what mood you were in at the time any one of these was a fun choice. For a more filling choice in retro candy is the Bit-O-Honey bar. Caramel taffy with nuts was sure to satisfy your sweet tooth. This was a favorite to buy at the movies along with popcorn and a drink. Besides tasting good this candy did have some health value which made parents like it even more. A favorite from years back as well as today is the Now and Later Candy. The Now and Later Candy is fruit flavored and has a taffy-like consistency. Popular flavors are strawberry, lime, grape, cherry and apple. The original colors for this candy were green, blue and red. Now there are over twenty-four flavors from which to choose. If you are searching for the ideal gift to give for birthday, anniversary or any special reason consider the retro candy gift baskets. These can be customized just for you. 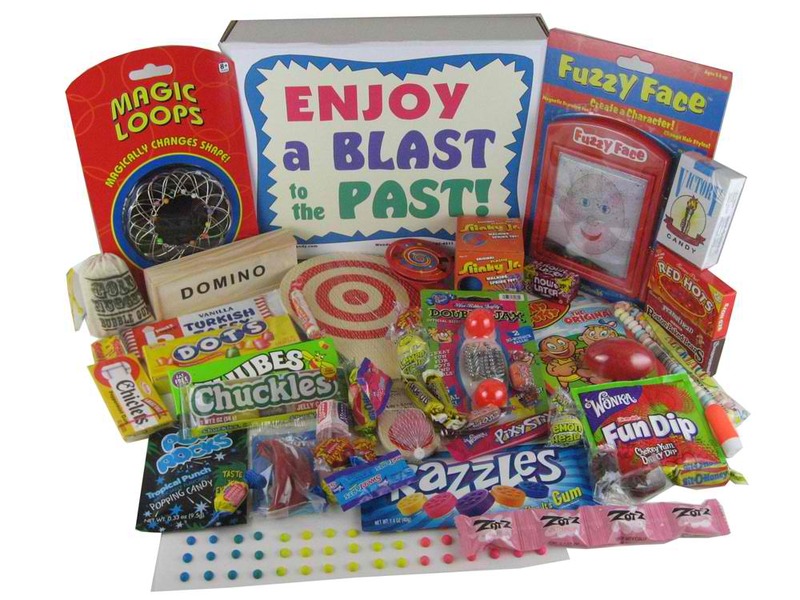 Retro candy gift baskets are fun to give and fun to receive. Order today!! The Sweet Age of Sixty!